Once you have learned the basics of crochet, there are many more techniques which, once learned, can really widen the scope of what you can acheive with just a hook and a ball of yarn. First though, it is absolutely fundamental that you should understand the turning chain and how to use it. Without this understanding you could find yourself with a piece of crochet that gets wider and wider or narrower and narrower. It is the one thing that gets beginners in a tizz and a confusion and some will give up. But really it is quite easy to understand once you know how. For the most basic techniques needed for crochet: making a slip knot, how to hold the hook and yarn, how to make a chain and all the basic stitches go to Beginner Crochet for illustrated guides. This is so easy. Simply work more than one stitch into the same place. See Instructions for increasing crochet for further instructions and photos. Decreasing is a little more complicated, but still not difficult. To decrease you need to work 2 stitches together into one. 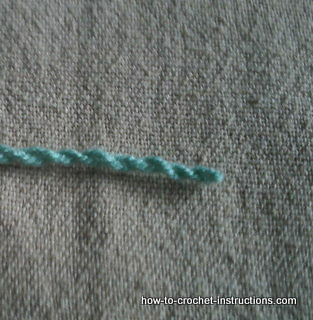 You do this by working the first stitch but omit the last pull through of your yarn. Do this again with the second stitch (and the third or even fourth or more, depending on how much you want to decrease by in that place). Then pull the yarn through all the loops left on the hook. See instructions for decreasing crochet for full instructions with illustrations. There is so much more to crochet than you would think. Here is a list of other techniques y ou might be interested in. A very useful additon to crochet or knitting is the twisted cord Which can be used for making bows, fringes, ties, laces and other embellishments.